Free 30 minute meditation weekly - Thursday mornings from 11:30 - noon. Join us for yoga class before meditation at 10 am - $15 drop-in rate. I look forward to seeing you! 60 minutes of chair-based yoga with some standing and floor work (for those who are able to transfer), followed by 30 minutes of guided formatted deep relaxation. Therapeutic or adaptive yoga welcomes adults with neurological or autoimmune disorders, arthritis, mental-health issues, brain injury, stroke, chronic pain, and other disabilities. Traditional yoga is adapted through the use of props, partial postures or movements, pranayama (breathing practice), and yoga-inspired body awareness exercises, so that students, regardless of ability, can receive the benefits of yoga. We practice in straight-back chairs, wheelchairs, standing with supports if required, or on the floor, depending on the needs of the students. The needs of the students determine the goals of each adaptive class. During the guided meditation the instructor talks while the students rest in savasana (either in chairs or on the floor). It is a formatted kind of deep relaxation, guided in a specific way to induce deep physical relaxation combined with subconscious. This guided meditation has been found to be useful for healing chronic pain, post-traumatic stress and insomnia. This class is free to persons living with Multiple Sclerosis who are approved for sponsorship by the GA MS Society. This chair yoga class is designed for All Bodies and has all the benefits of a regular yoga practice without the challenges of getting down onto a mat. 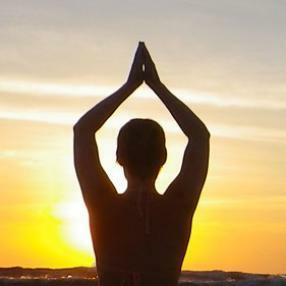 The class beings with a short meditation connecting mind-body with the spirit focusing on the breath “to find a quiet mind and come into stillness.” We move with comfort & ease in the body-mind through a refreshing breath centered Hatha yoga practice. It’s an effective and gentle way to have better flexibility, strengthens bones & the immune system, stretches and tones the muscles, provides joint lubrication and reduces stiffness, improves balance, and mental alertness. These classes are a GREAT entry point for students OF ALL AGES AND BODY TYPES to gain an understanding of the movements and language of yoga. “Movement is your medicine … Work with your body rather than against it”. Practice pranayama and meditation. All are welcome. Yin Yoga: If you are looking for a deep stretch, this is the class for you. Yin Yoga pairs well with the more aggressive Yang, flowy classes as well as aggressive, athletic workouts. The room is cooler and poses are held between 3-5 to bypass the muscles and get deep into the connective tissue. Connective tissue is where emotions and stress like to hide. This practice allows them to come up so then can be let go. Perfect for both the athlete and spiritual seeker alike. Guided Meditation: one can embrace the power of stillness and breath, and purifying of the mind through meditation.